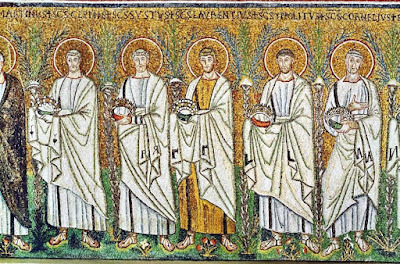 On the tenth of this month [August], we commemorate the Holy Martyrs Lawrence the Archdeacon, Sixtus the Pope of Rome, and Hippolytus. Is thoroughly baked over the bed of coals. Having contested like an athlete O Sixtus through the sword. Facing the sufferings he was called to suffer. 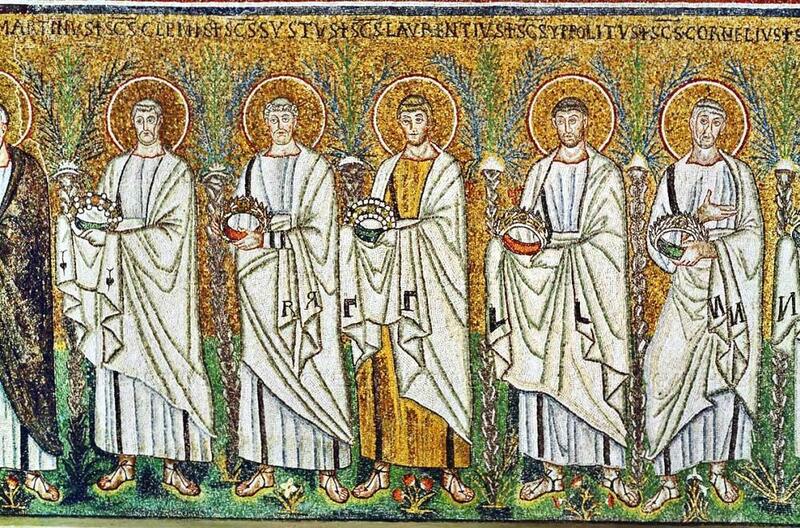 These Saints flourished during the reign of Decius (249-251). * Saint Sixtus was from Athens, where he was taught in the lessons of philosophy. When in Rome, he was ordained Bishop, after Saint Stephen the Pope of Rome (Aug. 3) was martyred. Because at that time they were in the labor pains of persecution, Saint Sixtus ordered Lawrence the Archdeacon to be the steward of the treasures of the Church of Rome, of which the divine Lawrence distributed them to the poor. When Decius returned from Persia, he had Saint Sixtus brought before him. 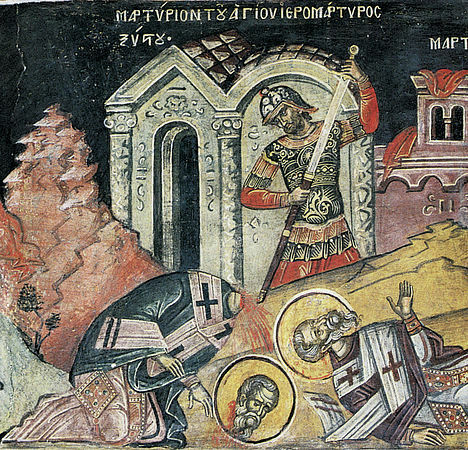 And because he could not persuade him to deny Christ, and instead he confessed with boldness the true God and Creator of all, he was beheaded, and the renowned man received the crown of martyrdom. He then had Lawrence the Archdeacon brought before him, who was asked by Decius to repay a debt, and to receive the treasures and money of the Church. Therefore Lawrence asked for carriages, on which he put the poor, the lame and the maimed, and he distributed to them the money, and he brought them to the emperor. When the emperor saw this, he was enraged, and ordered for the Saint to be harshly beaten, and then he was placed in prison. There the Saint healed all the sick who came to him. When the tribune Kallinikos, who was set over the prison, beheld these healings, he believed in Christ and was baptized. After these things Saint Lawrence once again stood before the emperor, and because he refused to sacrifice to the idols, he was stretched out over a burning gridiron, under which a fire burnt. While the Saint was thus stretched out, he thanked God, and delivered his spirit, receiving the unfading crown of the contest. 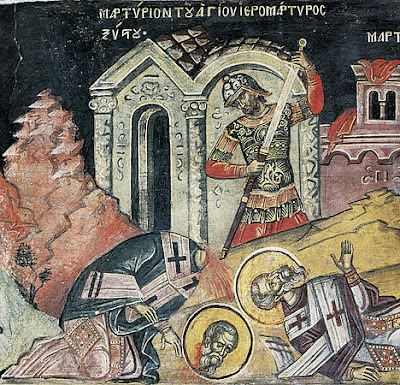 The relics of Saint Lawrence received a proper burial by Saint Hippolytus. 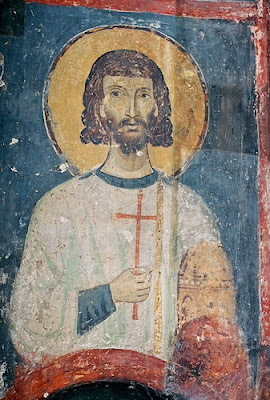 When the impious emperor learned of this, he had Hippolytus brought before him, and ordered that he be beaten with an iron scorpion,** and then he was to be tied to wild horses, by which the athlete of Christ was violently dragged over a long distance, and he delivered his blessed soul into the hands of God. His Synaxis is celebrated at the so-called Three-apses, near the Capitoline of Rome. It is said that seven days after the martyrdom of Saint Hippolytus, the emperor Decius and Valerian went to the theater on their horses, and there they cast away their defiled souls. And Decius cried out at the time of his death: "O Hippolytus, as you were a slave, so you pull at me while bound." And Valerian cried out: "Hippolytus has bound me with fiery chains, and is pulling at me." These words became known throughout Rome, and from Rome became known throughout the inhabited world. Hence everyone's faith in our Lord Jesus Christ was made firm. * In actuality, they were martyred during the persecution of Emperor Valerian (253-260). ** The Roman scourge, also called the "flagrum" or "flagellum" was a short whip made of two or three leather (ox-hide) thongs or ropes connected to a handle. The leather thongs were knotted with a number of small pieces of metal, usually zinc and iron, attached at various intervals. Scourging would quickly remove the skin. Sometimes the Roman scourge contained a hook at the end and was given the terrifying name "scorpion." Aflame with the Spirit like a living coal, thou didst burn up the thorns of error, O blessed trophy-bearer Lawrence, archdeacon of Christ. Like rational incense thou didst become a whole burnt offering, to Him Who magnified thee. Wherefore shelter from all assaults of the enemy those who glorify thee. With divine fire thou didst kindle thy heart, O Lawrence, and reduce the fire of the passions to ashes. O staff of athletes, God-bearing Martyr, thou didst cry with faith while contesting: No one shall separate me from the love of Christ.